Growing number of electronic components in automobiles is recognized as one of the primary growth factors for automotive battery market. Passenger cars witnessed the high adoption of electronic solutions such as safety, comfort, infotainment systems on the back of technological advancements. This has significantly triggered the development of efficient and advanced battery technologies, which is driving the growth of automotive battery industry. Lithium-ion batteries are playing an important role in development of electric vehicle industry and are used in majority of electric vehicles, and it is likely to remain dominant over the forecast period. Several electric vehicle manufacturers such as Tesla and Nissan have invested heavily in this technology. Such capital investment and R&D activities will further propel the growth of automotive battery market growth. The report covers the present ground scenario and the future growth prospects of the global automotive battery market for 2016-2024 along with the total revenue of automotive battery market in every region. We calculated the market size and revenue share on the basis of revenue generated per segment and region. The revenue forecast is given on the basis of number of market players and current growth rate of the market. Global Automotive Battery Market Report has been prepared based on an in-depth market analysis from industry experts. The report covers the competitive landscape and current position of major players in the global automotive battery market. The report also includes porter’s five force model, SWOT analysis, company profiling, business strategies of market players and their business models. Global automotive battery market report also recognizes value chain analysis to understand the cost differentiation to provide competitive advantage to the existing and new entry players. 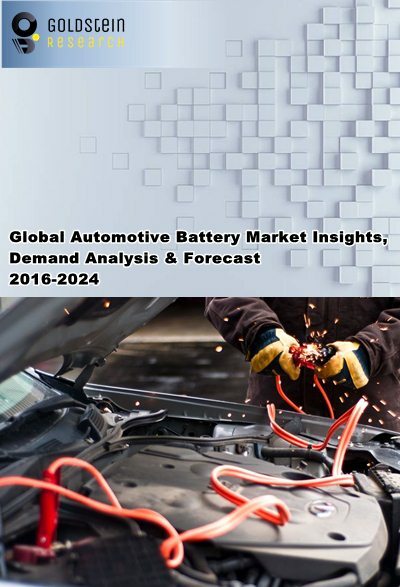 Our report comprises of the following companies as the key players in the global automotive battery market: Exide Technologies, Johnson Controls International plc.,Panasonic, Robert Bosch, Haldex Incorporated, ZF TRW Automotive Holdings Corporation, Hitachi Ltd., EnerSys, Furukawa Electric Co. Ltd., Leoch International Tech, GS Yuasa Corporation, Crown Battery Manufacturing Company and BYD Company. According to the report, major driver in automotive battery market is emerging market of lithium ion battery powered electric vehicles around the world. Electric vehicles are highly attractive for their potential to reduce greenhouse gas emissions from vehicles and to minimize the dependence on oil. By 2020, more than one third of new vehicle sales will likely consist of hybrid-electric, plug-in hybrid, and all-electric models, which is likely to drive the growth of Li-ion battery market. Further, the report states the challenges in global automotive battery market is high cost of efficient battery technologies such as lithium ion batteries for electric vehicles. The exponential growth of advanced automotive battery technology for the latter applications will depend largely on the cost, safety, life cycle and power density, which are the major challenges to develop cost efficient and high power density automotive batteries. For a full detailed overview, send us requset for market report sample.